MOSCOW, March 30. /TASS/. The Russian Foreign Ministry on Friday will lodge notes of protest with the ambassadors of countries that earlier expelled Russian diplomats. «On March 30, the Russian Foreign Ministry summoned the heads of a number of diplomatic missions accredited in Russia whose countries had taken unfriendly actions towards Russia in a gesture of ‘solidarity’ with Britain over the so-called Skripal case. The ambassadors will be handed notes of protest and informed about Russia’s retaliatory measures,» the Foreign Ministry said. 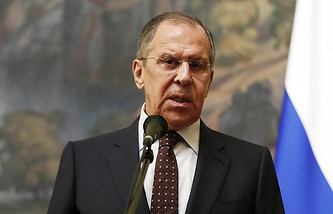 A TASS correspondent reports that the ambassadors of Germany, France, Poland and Italy have already arrived at the Foreign Ministry’s office in Smolenskaya Square. British Ambassador Laurie Bristow visited the Russian Foreign Ministry earlier. He kept quiet about the purpose of the visit.